South Indian cuisine is incomplete without sambhar & chutney. What makes it unique is that one can enjoy it with various chutneys & sambhar. Ideally I love to have idlis with sambhar as well as chutney but one can enjoy it with any one of these too. 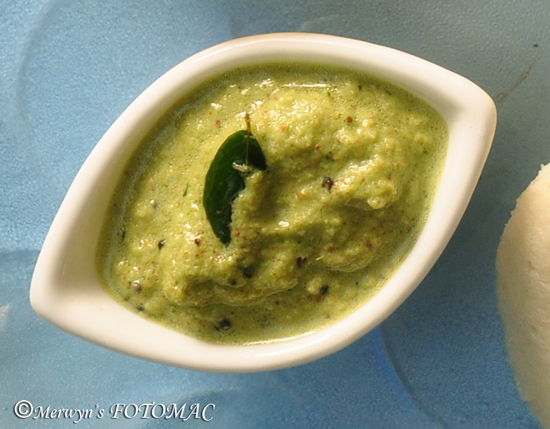 Today’s post is the chutney to go with the idlis I posted earlier.. Grind together coconut, green chillies, ginger, chana dal, coriander leaves & salt in a blender/masala grinder with a little water to a fine & thick paste. Transfer to a serving bowl & keep aside. Heat oil in a tempering pan & add the mustard seeds, curry leaves, red chilli & sugar. Stir till the mustard crackles. Pour this tempering over the prepared chutney & stir well. Serve with dosas, idlis, vadas or as desired.